Providing All of Your Septic System Services. As a home owner it is your job to be as informed as possible. Ask us what we can help you with. Septic Supply Shop, fully licensed and insured, has been operating since 2006 servicing all of the City of Ottawa and surrounding areas. In 2011 two employees Don Brown and Stephen Boulet purchased this side of the company from Green Valley Environmental. Located on Bank Street between Greely and Metcalfe. As a more centralized and accessible location serving people more easily. Pumps floats pipe fittings and any materials needed for today's septic systems. Special Orders can also be made. 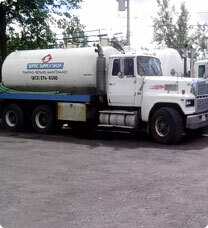 We pump all forms of septic tanks and holding tanks, and have digital metres on our truck to provide accurate volumes. We do all forms of repairs and retro-fits as needed to ensure your tank is up to code. All septic systems require maintenance from cleaning filters to pumpouts and more.